It finally happens. The moment my wife and I have been anticipating for so long has arrived. Almost everything packed and we’re ready to move to our new house in Merritt. We’re looking so much forward to this. My wife and I are absolutely in love with Merritt. In fact many of our friends envy us. Merritt is a very beautiful little town set in a vast wilderness area surrounded by ranches, expansive forests and crystal clear rivers and creeks. Merritt’s slogan says “Merritt fish a different lake everyday for as long as you stay”. Merritt is located in Okanagan area, which is known as one of the best hunting areas in British Columbia. From that viewpoint Merritt is also the perfect location for the Othmar Vohringer SHS headquarters. Tomorrow our Internet will be disconnected and ones we moved and everything is moved and set up in the new house (in about one to two weeks) we will be connected again. During this time there will be obviously no blog updates. 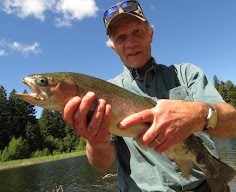 I am looking forward to come back and write about my fishing, scouting and hunting endeavors around Merritt.